At first, I found this map to be vexatious. Why? Because it's not a straightforward map, it's a bit complicated. So I went into god mode and flew around the map to learn what to do. After educating myself, the extra challenge built into the map became fun. It's one of those maps that offers more the more you play it. The bots demonstrated to me that there are more ways than one to return the flag. They will use alternate paths if being chased, they'll seek out the hidden grotto for the kegger, but I never saw them going for the redeemer or the thigh pads. They might have been too busy doing other things. A long bridge joins the bases, which gets a little hairy running back with the flag. I loved the missiles flying past my head while I was zigzagging across the bridge. If you prefer, you can leap down and run the length of a crescent, make your way up through a building, then emerge for the last leg of your journey back for a point. Underwater is also an option. There is scuba gear to assist you, and you'll probably want to use it since the swim is rather long. I didn't try the underwater route, but the bridge, and the crescent route is harsh. The visuals are pretty good as well. You have lots of custom textures, plus some scripting for the flags which bangs home the theme with an exclamation point. Custom music and many sounds are incorporated into the symmetrical layout. Lots of ambient sounds with their radii attended to nicely, triggered sounds, lift and mover sounds, just the way I like it. The skybox looks a little funny if you're up high in the nuke tower looking down, but I was usually too busy guiding my nuke to notice it. You face away from the enemy base in the nuke tower, so you sail a missile out the window, then loop it around and head it toward the enemy base looking for doomed red dots. The shieldbelt is in the middle of the long bridge; good luck getting it if you're playing with a bunch of bots. Other goodies are all spread out, and there is just enough ammo to make the charge for the flag, so don't get trigger-happy. The lifts are rather slick: There are sliding bars covering some lift openings, and they will spread apart so you can access the ride. The z-axis is there as well, so snipers should have fun. I'd say the greatest appeal of the map is it's different. The long haul over the bridge is a no-brainer, yet treacherous, but the haul around the perimeter, and underwater adds a nice twist. It's a bit like Face with the long haul outdoors and the sniping/z-axis stuff, but there are far more things to do and see. Play it with at least 8. Twrecks, that is sweet. Multiple paths and stuff. and the music! just my liking. good work! WOW, I think I just got a high score from nobody :) Not really a 10 map, but it's mine. Thanks for the reviewage Q.
I liked the map, but it isn't worth an 8, which is a score for maps nearing pro quality. but what does vexatious mean!? ah! found it... 'lastig' and it really is!! I agree with everyone else. Its a fresh change of pace, granted, but the layout could be more effective. Watch it with those polys. What I gave it originally, despite the fact the maker is a moron. I agree with C.H.U.D and Mapped.This is a 7. Love this map. It's got unique gameplay with the crescent and the bridge. Also flying under the crescent-island with strangelove is great. 's an OK map I guess. It is a bit confusing though. But, If you're one of those people who dedicate all of their time to a map until they have mastered it, change this rating to a 8.0 . P.S. Nice touch, putting the anti-grav boots on that Island, them being the only way to get off of it. nice map, could have been better in places. didnt like the long underwater part. didnt like the get off elevator, get in elevator part. but overall pretty nice map. I love this map! One of the very best I've ever played! Excellent map. I really like the idea the author had of placing the flags in a different spot. I would have given it a 9 if that underwater tunnel would have been left out of this map. The underwater tunnel is too long, which messes up the flow a bit if you go in there to get the shock ammo or rifles. The bots never use the underwater tunnel. Can't blame them for not using it. Also the bots get stuck,for a few seconds, in the waterpool. It would be nice to see these quality maps re-released for UT, but with all the bot bugs gone and improved flow. Maybe one last UT mappack? For those of us who still enjoy playing UT. 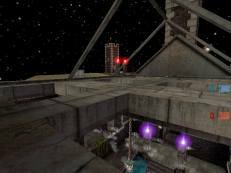 Im surprised this map never made much impact, its a good CTF map though you can't exactly tell from the screenshot.